On our way back from horseback riding, we decided to stop off at a scenic lookout, and it sure lived up to its name. The next day, after we finished our snorkeling trip and got off the boat, we decided to trek to the top of the island and stopped off at a couple of other spots. The first spot, Waimea Canyon, was nice and sunny and offered up a great view. One of the things that caught my eye was the palate of colors—shades of vermillion, rust, ocher, and brown interspersed with patches of green filled the valley. The shadows you see in the photos are clouds passing overhead. To me, this image captures a sense of the scope of this canyon. My friends look so tiny! One of my favorite images is this one that I caught at the Waimea Canyon Lookout. Like most places on Kauai, the lookout hosted a brood of feral chickens with at least one rooster. I got this shot of a food vendor feeding of the roosters in an unusual manner. She put a piece of food in her mouth and then waited for the rooster to jump up and pluck it from her mouth. Who knew roosters could jump like that? My guess is that they passed the time quite often this way, based on how good the rooster was at this. 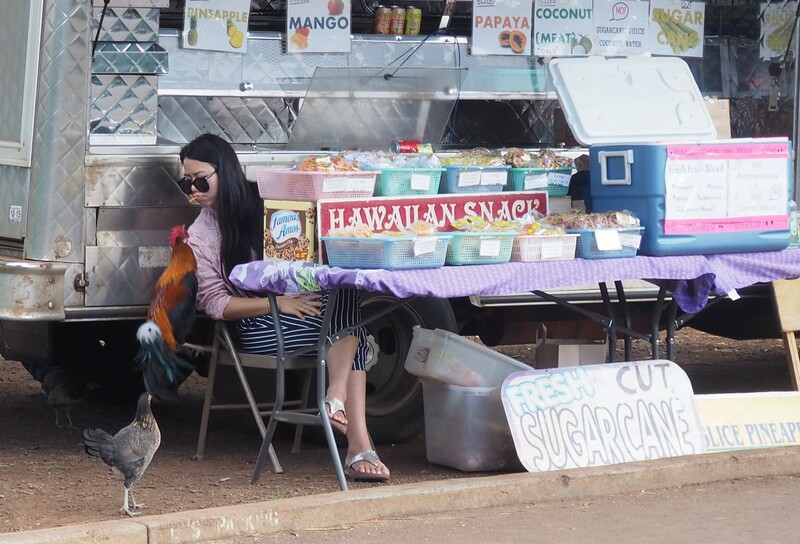 The hens could only look on with envy since that rooster wasn’t sharing any of his catch. We continued up the twisting, turning road to our next stop: the Kalalau Lookout at Wai’ale’ale. As we ascended the mountain to the top of Kauai, we drove through some cloud banks and by the time we got the lookout, the fog had gotten pretty thick. The clouds crept up the sides of the mountain—we could literally see the mist swallowing the mountain foot by foot. We watched and within about 15 or 20 minutes, the mountain was completely obscured. A brief glimpse of the water below before the cloud swallowed it up. My group venturing forward in the mist. This shot was taken just a few minutes after the last one—notice how much thicker the fog is. This is another of my favorites. I love the contemplative mood that this image invokes in me. My group joked that this was either way cool or something out of a horror movie. I went with “way cool”.